Mother nature continued to unleash above average rain totals thru the end of summer. The 2018 summer has been by far the wettest I’ve ever experienced. Anglers had to find windows of opportunity for river levels to be fishable. It typically takes several days following a rain event for rivers to crest. Water levels return fairly quickly to normal conditions. However just as the water leveled out and became fishable, the next rain event would roll in. 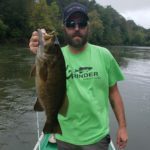 The North Fork of the Shenandoah River continues to fish well for the locals. Brad Carter and fellow angler boated 20 after work with the largest going 20 inches. Slow rolling spinnerbaits and Double D green pumpkin tubes were working well on the North. Randall Grove and fishing partner also logged a 75 fish day between Woodstock and Maurertown with the largest smallmouth going 20 ¼ inch. The topwater bite was the best he ever experienced with a Double D Jigs show stopper plopper. Shakeyhead and spinnerbaits were also producing in the murky, stained water. Make time to get on the water in the month of October. Water temperatures will continue to drop to favorable ranges for river smallmouth. With cooler temperatures and winter just around the corner bass will be feeding more often. Also consider water levels will be higher than normal and a better color this fall compared to years past. Also fishing pressure has been less this year due to all the rain. 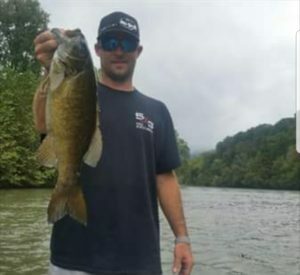 Throw in the fact many outdoorsman will take to the woods this month, there’s a good chance you will have little competition on the water and the fishing should be on fire! Look for bass to push up into the shallower water following the baitfish and forage. Because smallmouth like to move and transition, plan to cover as much water as possible. Target the banks, mouths of creeks, as well as up in the creeks. If these areas don’t produce pull out into the middle of the river and look for bass suspending along ledges. Fall is a great time of the year to throw the Hellgrammite on small jig hook. The NIKKO brand is gaining in popularity. Tie on the NIKKO Hellgrammite in a Brown Gold Flake color. Big Bass Daddy Custom Baits also has a dynamite realistic looking plastic Hellgrammite that is guaranteed to catch fish. I would recommend the Green Pumpkin Black or Moss Green Black Flake colors. Hook them thru the head, wacky style, or nose hook them. Jig them, drag them, or consider using them on a drop shot presentation. Other lures to consider covering the middle of the water column would be a medium depth squarebill crankbait of choice. The Livingston Pro Ripper lipless crank will also produce on a reaction bite. This slow sink design with rattles and electronic baitfish sound technology promises more strikes. Be sure to throw a ½ ounce or 3/8 ounce spinnerbait of choice. Add a split tail or boot tail trailer. Vary speed of retrieval including a slow roll technique. Unlike the summer months, the fall topwater bite can be productive throughout the entire day. The ZMAN Pop Shadz is a weedless plastic floating topwater popper. Rig it with a 4/0 wide gap hook. The LiveTarget topwater Frog won Best New Hard Bait in 2012. This hard body frog has wide plastic mouth that spits water. The feathered trailer hook further entices those hungry smallmouth to take this topwater morsel. Drag jigs, lizards, plastic worms, senko’s, or creature baits along the river bottom to cover the lower depths of the water column. An old tried and true work anywhere, anytime lure is the Gary Yamamoto Hula Grub. Throw it up river, let it sink, and let the current do the work. The plastic skirt, soft perfect size body, and kicking craws simulate the smallmouth’s next crayfish meal. Drag or pop it periodically and wait for the tap tap before setting the hook! Most anglers will tell you the spring and fall seasons are their favorite time to be on the water. Water temperature and bass needing to feed up for the winter will increase your chances for success. The opportunity to catch the bigger bass is another reason to get out. Don’t worry about throwing the perfect lure in the perfect color in the right spot. If you are fishing for a living or fishing to feed your family than you may need to strive for perfection. Otherwise grab your rod and a few lures get on the water and start chucking and winding and enjoy your time on the water!